When I attended the Stampin' Up San Antonio regionals a couple weeks ago, we did a make and take that featured a flower made out of ribbon. As I was making it, I thought to myself how cute it would look made out of red on a Christmas card and thus, my ribbon Poinsettia card was born! What I really love about this card is the simplicity of it, yet it just makes a statement. Not to mention everyone wants to know how you did it...LOL! 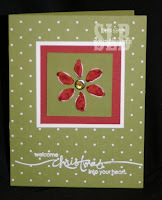 All products from Stampin' Up. Ooh, striking! I really like it! As Amy said, it is striking! I love the colors and the simpleness of this card. This is an amazing card! I didn't know you were at the SA Regionals - so was I! I wish we could've met!!!! Wasn't it great!! I love this idea! What a pretty Christmas card. We made this at KC regionals also!